Photos by Chanda Brietzke (left) and Jessica Brown. 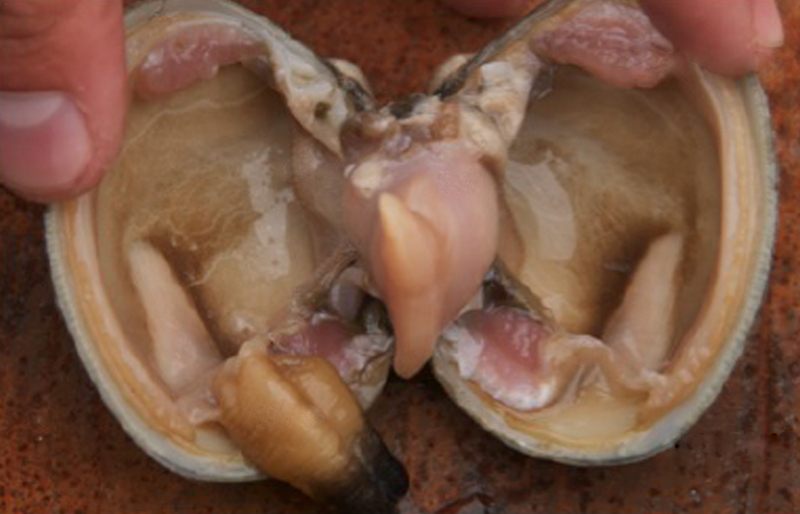 The Pacific littleneck clam has a chalky shell that ranges from round- to oval-shaped and is a maximum of 7 cm long. The shell is inflated and has a visible external hinge ligament (see right-hand photo). The valves bear many radial ribs as well as some concentric ridges which are more prominent at the anterior end (click here for information on shell orientation); the ribs and ridges create a lattice pattern. 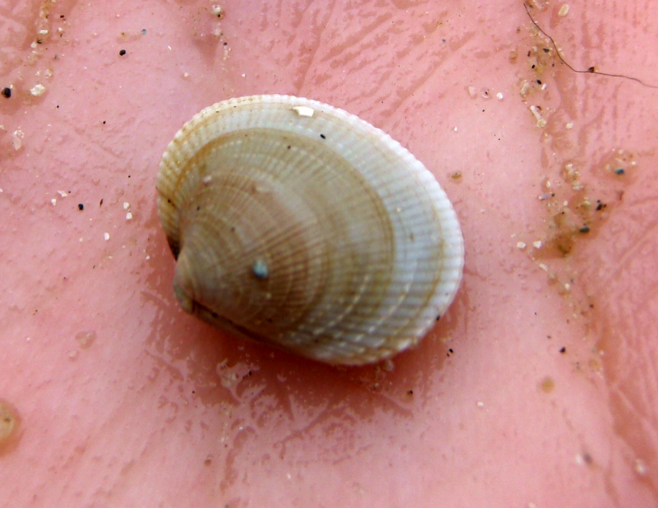 The shell is white to brown and may be marked with dark patterns. A key identifying characteristic is the line of tiny ridges running along the inner edge of each valve. This clam has short fused siphons. The Pacific littleneck can be found buried to 10 cm deep in sand-gravel-mud sediment, from the mid-intertidal to depths of 10 m in the subtidal. It is a relatively slow digger, and so is not found in areas with unstable sand. It usually found on protected beaches, though may occasionally be found on more open gravelly shorelines. Its range extends from the Aleutian Islands to southern Baja California. It is also present on western Pacific coastlines, from Siberia to northern Japan. The Japanese littleneck clam (Venerupis philippinarum) is an invasive species and is more abundant than the Pacific littlneck. The main, most reliable distinguishing feature between it and the Pacific littleneck is the ridging on the inner edge of the latter's shell; the inner edge of the manila clam shell is smooth. This species is fast-growing, and is harvested in the wild by hand (the minimum harvest size is 3.75 cm). The Pacific littleneck clam is harvested for steaming and for cooking in chowder; one source suggests steaming clams and dipping them in garlic butter (Lamb and Hanby). Click here for some recipe links. Harvesters should be wary of red tide warnings, as this species is susceptible to PSP (paralytic shellfish poisoning). Cowles, D. (2007). Leukoma staminea (Conrad, 1857). Invertebrates of the Salish Sea. Rosario Beach Marine Laboratory. Accessed 05/09/2014. Harbo, R. M. (2011). 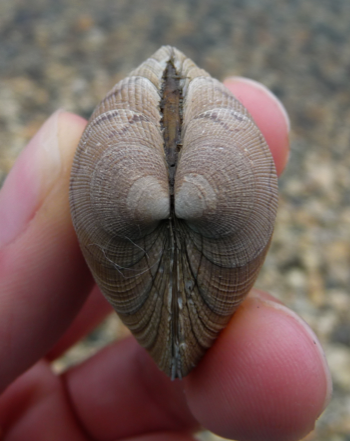 Whelks to whales: Coastal marine life of the Pacific Northwest. 2nd ed. Madeira Park, BC: Harbour Publishing. P. 130. Lamb, A., and Hanby, B. (2005). Marine Life of the Pacific Northwest [electronic edition]. Madeira Park, BC: Harbour Publishing.